Sean Hannity–the self-described “registered conservative”, on-again, off-again journalist and leading Republican apologist, has a huge audience in the millions who hears him on radio and television daily repeating the same lists ad nauseum (which are accurate) concerning the economy, food stamps, unemployment, etc. as a critique on the Obama administration, the growth of government and liberalism in general. Despite him proclaiming his “conservatism” and being a leading voice on the airways, I would like to suggest to you that Mr. Hannity is not a conservative, in fact, he really has no core. He is an entertainer and a businessman that follows the ratings and the R (Republican) is of utmost importance, no matter how unconservative, unconstitutional that particular R may be. It’s all about the R.
George W. Bush represented some of the worst in constitutional conservatism in modern history and he and a Republican Congress, which he had for six of his eight years, exploded government unlike anything since LBJ. Hannity loves to attack Mr. Obama’s horrible policies that has led to a doubling of our national debt and for good reason. The debt went from just over $10.6 trillion when Obama took office to some $19.5 trillion today, clearly an issue that none of the government seems prepared to deal with. However, Mr Hannity declines to say that the debt also doubled under Mr. Bush. When Bush’s term started Jan. 20, 2001, the gross federal debt was $5.73 trillion. At the end of his term, Jan. 20, 2009, the gross federal debt was $10.63 trillion. Hannity neglected to critique the former President not only for this, but for a long litany of big government, unconstitutional federal programs. Let’s take a look–No Child Left Behind (greater federal spending and intrusion with nothing to show for it), the Medicare prescription-drug benefit, the largest entitlement program created since LBJ, a massive expansion of the regulatory state, an unconstitutional war in Iraq, an addition executive department which includes a bumbling Transportation Security Administration and the biggest trampling of the Fourth Amendment ever in the Patriot Act. How about Mr Bush’s TARP or his executive order that created the ultra secret Cheney Energy Task Force? According to data published in a Mises Wire earlier this year, Mr Hannity’s previous two biggest idols, Ronald Reagan and George W. Bush were the worst offenders of federal spending. What about all the executive orders issued by President Bush or his appointment of Czars? Bupkis. During the Bush years and the horrible, unconstitutional policies that occurred, not once did Sean Hannity ever critique any of it. In fact, he promoted several of them. Did Hannity take on No Child Left Behind–as a journalist or a commentator? Crickets. If Mr Hannity was concerned about adhering to the restraints of the Constitution and true limited government, not once did he make this known while Mr Bush was in office. 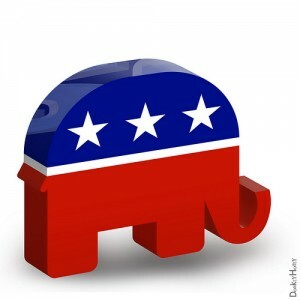 When the Tea Party movement appeared on the scene roughly in 2007 with the Ron Paul movement, prior to Barack Obama taking office, the grassroots movement hated what Republicans did during the GWB years and the incredible spending and government intrusion. The people at neocon, establishment Fox News initially kept the Tea Party at a distance, sometimes mocking the people and not really getting or understanding the principles being espoused. However, after a period, the movement grew and grew fast and couldn’t be ignored anymore by the likes of Glenn Beck (who launched the 9/12 project in 2009) and the exploitive Sean Hannity. Hannity clearly saw this as the direction to move as his idol George Bush lost favor with many in this movement. Being the businessman and entertainer, Hannity was on board. This fit in well with Hannity’s schtick to blast (deservingly so) the big government policies of the new President, Barack Obama. In his hijacking of the Tea Party, Hannity hosted a number of events, got close to Tea Party leaders and criticized every move of Barack Obama. The use of the Constitution became a mainstay of Hannity’s new found rhetoric. 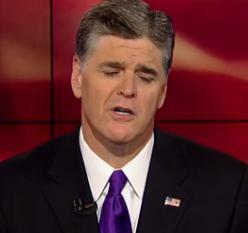 The Tea Party, for Mr Hannity, was all about the R.
Move over George W Bush and the Tea Party is not much more than rubble and Hannity has moved on– Sean is now a Trump apologist. The Constitution is rarely mentioned these days and the populist, Make America Great Again is now the mantra. Mr Hannity doesn’t question anything about what Donald Trump says or about his policies, despite having the Republican nominee on his radio and television programs frequently, sometimes for an hour at a time, and no serious questioning ever happens ( Just check the transcripts for yourselves). Did Sean Hannity ever ask him, Under what authority can you do this? Of course not. You’d think waterboarding would be a serious issue for Sean as he has gone seven years since being challenged and accepting to have it performed on him. Did Hannity ever question the viability of his plans for tariffs? 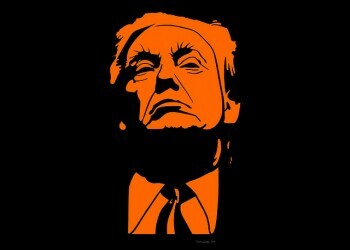 Mr Trump once said, “First of all, you never have to default because you print the money. I hate to tell you. So there’s never a default.” Did Hannity ever discuss the issues of inflation and hyperinflation? Nah. What about Mr Trump’s unconstitutional positions of ignoring the Fifth Amendment and its protections for property rights? If that was Mr Obama or Mrs Clinton, Hannity would be all over it. Times like this I wish I knew if Hannity considered himself a journalist or not. Mr Trump’s positions on a “total and complete shutdown” of Muslims entering the United States and the government having the power to close mosques? This offends multiple constitutional principles. Did it offend Mr Hannity? If any of these things were proposed by a Democrat, Hannity would be all over it, and rightfully so. Is this how a “registered conservative” acts? No questioning concerning federal subsidies for child care. Trump has said the government should be able to censor parts of the Internet. Where is Hannity’s outrage? In December, Trump said one of the first things he’d do if elected is sign an executive order mandating the death penalty for cop killers. Did Hannity ever ask him again under what authority considering this would be a state function? This gives a good glimpse of the dangers of executive orders coming out of a Trump White House, something a “registered conservative journalist?” like Hannity should fight against. Related: What do I want from the President? Mr Hannity frequently gives a list of things Mr Trump will do, including Supreme Court appointments. But how can we be sure about anything he says, including Hannity. Trumps spent decades as a big government liberal and has supported position such as government run health care and horrendous partial-birth abortion. Has Hannity ever got a real good fundamental explanation for his position changes. It’s great if Trump changed these positions, but why did he? Doesn’t matter, It’s all about the R.
Sean Hannity rightfully critiqued President Obama using a Constitutional argument many times. Where was Hannity to dissect this scary statement? The list could go on and on. No matter how atrocious or questionable the policies and philosophies of Mr Trump are, Hannity is on board 100%. Hillary Clinton is also a horrible candidate and the damage she’ll do is immeasurable. However, Trump may be just as bad so just because he has an R or because he’s a good friend, does that make it acceptable? If you lack a solid constitutional, conservative core, the answer is yes. I’ve read in the comment sections of numerous articles about Sean Hannity over the years and many Hannity-haters would call him a whore. I am too much of a gentleman to call him that; however, it is abundantly clear that Sean Hannity has no core. What makes this so sad is millions listen to him and follow his words to mind and heart, confusing Constitutionalism in a terrible way. I agree with what you are saying but you really need to work on your writing, grammar and verbiage. Wow.